Tigerflex™ Ureflex™ UFCâ„¢ Series Heavy Duty Polyurethane Lined Material Handling Hose is designed for dry applications where severe abrasion is a factor; provides for longer hose life and lower operating costs versus rubber or PVC hoses. Static dissipative cover prevents the build-up of static electricity for added safety and to help keep material flowing smoothly. Transparent construction "See-the-flow." allows for visual confirmation of material flow. 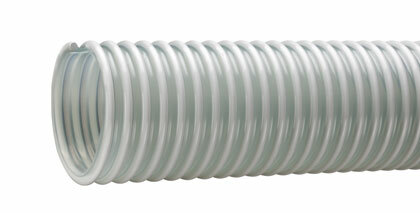 Use of "Cold-Flex" materials allows the hose to remain flexible in sub-zero temperatures. Click here for more info.